Norway’s cyber roots began in 1971 when it became the first non-English speaking country to access the world wide web. Similar to other Scandinavian countries, Norway has an exceptionally sophisticated telecommunications market with high broadband and mobile penetration rates. The country’s digital media sector is also well-developed. According to Norwegian statistics, in 2013 nearly 100% of all Norwegian citizens had access to the internet. In 2012 the country was ranked 8th in the world for having 84.6 broadband subscriptions per every 100 citizens. A 2011 report from Akamai showed that the city of Lyse, Norway had an average internet connection speed of 8.1 Mbps, which at the time was the fastest internet speed in Europe. A September 2016 report from Akamai showed Norway had an average internet connection speed of 20.1 Mbps. This is second only to long-reigning technological juggernaut South Korea, who had a 27 Mbps average connection speed during this time. This means Norways internet speeds have increased by 55 percent from previous years, and this is only expected to continue. By moving past Sweden in speed, Norway now has the fastest internet in Europe. Fiber optic cables make up a majority of Norway’s internet infrastructure. Nearly every Norwegian city has access to internet speeds from 2 Mbps up to 10,000 Mbps. Because most internet service providers are connected to the Norwegian Internet Exchange (NIX), the competition between providers is fierce. A basic ADSL connection can cost as little as $30 a month. Apart from its well-refined infrastructure and fast internet speeds, Norway is also a great hosting location due to the country’s respect for internet privacy. Norway has a constitution and laws that protect freedom of speech and of the press, and the Norwegian government is generally viewed as respecting these laws. A report from OpenNet Initiative (ONI) back in 2009 supports this notion by indicating that there was zero evidence of internet filtering (censorship). The only form of internet filtering comes in the form of a DNS filter used by Norwegian ISP’s which blocks any sites related to child pornogrophy, similar to what Denmark has in place. Another form of mild censorship came in September 2015 when the Oslo District Court ordered internet providers to block domains belonging to seven file-sharing websites, with The Pirate Bay being the biggest name on that list. Similar action was taken against eight additional file-sharing websites in June 2016. The top-level domain internet country code for Norway is the .ro extension, and the country is not a member of the European Union. Convinced of the benefits that come with hosting your VPS in Norway? Great! 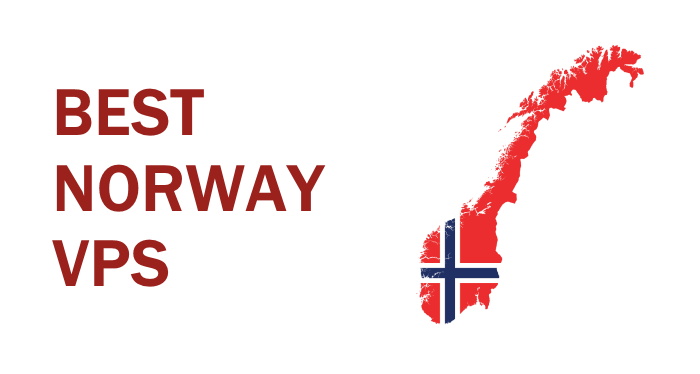 Feel free to check out our list of the best Norwegian VPS providers on the web. Onlive Server Technology LLP was founded in 2008. The company offers a full suite of dedicated, cloud, VPS, email, and shared web hosting solutions with servers inside over twenty different data centers. Their VPS servers in Norway are available on both Linux and Windows operating systems, although Windows costs an additional $10 per month. Onlive Server does not specify which data center or types of hardware they use. Installing a cPanel or Plesk costs an additional $12 a month, while adding extra bandwidth to your VPS also comes at a steep price. Definitely not the best VPS in Norway, but worth mentioning. OOGEOO was founded in early 2001 and was formerly known as MxHub. The company appears to have a high customer retention rate, but unfortunately they also sell branding, web design, and IT services, so 100% of their focus is not centered on web hosting. OOGEOO’s VPS packages are compatible with Windows and Linux OS, with Windows coming in at a slightly reduced cost. Each plan is fully managed, although adding a control panel comes with a $18 price tag, and they also do not provide any free dedicated IP addresses. Their prices aren’t exactly the best out there, but the company has a long-standing reputation as being a reliable VPS hosting provider. Server Bite is obviously well-equipped to handle websites that require a vast amount of resources. They’re also a nice fit for smaller projects, 25 GB SSD storage for just $23 is a great value buy. Apart from a variety of Cent, Debian, and Ubuntu OS, their Norway VPS plans are compatible with Windows 2008 and 2012 platforms. Highly professional service, locally-owned – recommend. Host1 has provided domestic and offshore hosting solutions to its diverse client base since 2009. Their infrastructure is based in Oslo with offices located in Oslo, Mexico City, and Cebu. A few noteworthy clients include Wikileaks and Sensorlink. Norway VPS plans are available with both a Linux and Windows 2012 R2 sotware license. While Host1’s prices and alloted storage space could be improved, the company is privately-owned, emphasizes the importance of privacy, and they accept Bitcoin. So if you’re looking for a VPS provider with integrity – choose Host1.no. Sircon.no maintains its own servers within an eco-friendly data center based in Norway. The locally-owned company’s office is based in Trondheim, Norway. Apart from offering various hosting services, Sircon also sells web development and design solutions, which isn’t ideal, but it’s not the worst offense. Sircon.no’s cloud-based VPS plans utilize VMware virtualization technology and are only compatible with Ubuntu and CentOS Linux platforms. Cpanel access costs an extra $11.75 a month, while storage space, memory, and bandwidth can be easily customized to fit individual needs. Sircon loses points for not stating the type of hardware they use, but overall this is a reliable Norway-based VPS provider who respects customer privacy. ServeTheWorld is one of the largest hosting companies within Norway. They have over 16 years experience and have services over 30,000 customers. They operate within their own data center in Oslo, Norway, which is capable of housing around 4,000 servers. In addition, ServeTheWorld is also a proponent of free speech and strictly follows Norwegian privacy laws. ServeTheWorld’s VPS servers use KVM virtualization technology, and therefor are not compatible with Windows OS. Not only does ServeTheWorld offer an expectional amount of computing resources, but their prices are great, they accept Bitcoin, and they also have a 90-day money back guarantee policy to back up their claims. LimyVPS is a VPS-specialized hosting provider who is constantly mentioned in our lists (and for good reason). The company has years of experience in providing VPS and dedicated server solutions to clients in dozens of countries using various data centers. Their Norway data center is located in Oslo. Hosting is fully-managed and is compatible with most popular operating systems, although Windows 2008 and 2012 R2 are only available for their largest packages. Their lower-tier plans are adequately priced for smaller users, although those with large business websites can find better value elsewhere. NavicoSoft is a IT company offering a variety of services based in Pakistan. Founded in 2004, NavicoSoft is one of the top five hosting companies within Pakistan. Their Norway VPS plans include a free no-risk trial. A free control panel is not included and server’s containing Windows OS cost a whopping $40 a month. While certainly not the best VPS provider in Norway, NavicoSoft is a solid alternative for small to medium size websites. Estnoc, short for Estonian Network Operations Center, was established in 2008 in Estonia. Estnoc maintains servers in 13 different data centers, ranging from Poland and Norway to Phillipines and Hong Kong. The company’s Norway data center is located in Fokserod Sandefjord, Norway. Estnoc’s VPS servers use KVM virtualization. Their lowest-priced plan can not be equipped with a control while cPanel costs an additional $17 a month for all other VPS plans. Overall their prices are highly competitive. Reliable VPS provider for medium size websites. VPSFast is a subsidiary of Compacta Web Ltd. and specializes in providing affordable VPS solutions using data centers across 35 worldwide locations. VPSFast focuses on providing high performance, fully redundant, and scalable VPS packages at super low prices. The company has received numerous web hosting awards and accolades since their inception. Each VPS runs on the KVM virtualization platform. Only their higher-tier VPS plans are compatible with Windows OS, but luckily it comes at no extra cost. Additional IP addresses cost an added $3 a month while IPv6 connection is free. We recommend using VPSFast.us as your next Norwegian VPS provider because they offer large amounts of SSD storage space, use the latest hosting technology with 1 Gbps ports, have excellent prices, and because they accept Bitcoin.